On Friday, May 18 from 7-8:30 p.m. Join us for Blossoming Into Spring with Soundbath by Harmonic Alchemy at the UUCRT for a heart-opening expansion into the fullness of your being as we ride the energy of nature’s blossoming into spring. Sound has been used for healing and expansion of consciousness for thousands of years. Therapeutic vibrations are known to reduce stress, quiet the mind, and relax the nervous system. The resonance and frequencies of sound healing instruments affect us at the physical (cellular) level, the energetic (chakras and channels) level, and the mental (brain waves) level, restoring the natural harmony of body, mind and spirit. 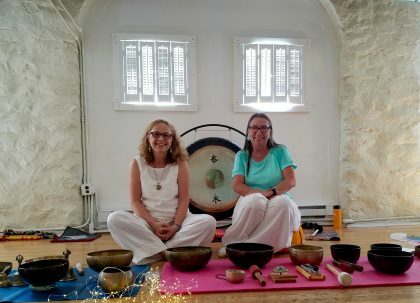 Using ancient and modern healing instruments, such as Himalayan bowls, crystal bowls, gong, drums, shakers, flutes and chimes, Celine and Julie will create a field of sacred sound and guide the group into deep meditation. This state of expanded awareness is where we can access insights from our deepest intuition and highest wisdom. Participants usually lie on the floor so please bring a yoga mat and light blanket. Some people like to have an eye mask. Chairs will be available for those who prefer to sit.